Deje que un guía amante de la gastronomía le conduzca por las calles de Puerto Vallarta para realizar un recorrido de cócteles y comida por la ciudad. Este recorrido a pie de 3,5 horas incluye degustaciones de tacos y postres junto con cinco cócteles mexicanos servidos por expertos cocteleros. Aprenderá sobre las raíces culturales de los licores como mezcal, tequila y raicilla, y pruebe el licor con sabor a café, el kahlúa, así como la michelada, el emblemático cóctel de cerveza de México. Este servicio tiene plazas limitadas, lo que garantiza una experiencia para grupos pequeños. 3.5 horas de comida y coctelería de Puerto Vallarta. Morder los sabrosos tacos y el delicioso postre. 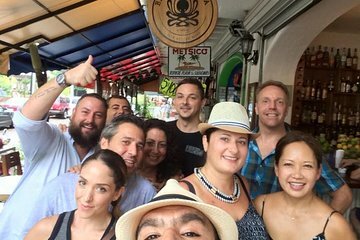 Reúnase con su guía en una ubicación céntrica en Puerto Vallarta para iniciar su recorrido gastronómico a pie con cócteles de 3,5 horas. Satisfaga sus antojos de excelente comida con cada bocado sabroso mientras sacia su sed de conocimientos y disfruta de los mejores cócteles. Haga una parada en cinco establecimientos, que incluyen restaurantes familiares y puestos de comida elegidos por su guía para mostrar la cocina y la bebida local. Deléitese con un cóctel de mezcal elaborado con lima fresca y pepino acompañado con un taco de pescado; deje que un coctelero prepare un margarita de jalapeño hecho con ingredientes naturales; disfrute de un taco de ternera gourmet preparado por un chef galardonado, y acompáñelo con un cóctel de raicilla servido en una jarra de barro tradicional; descubra cómo se hace una michelada (pista: cerveza y salsa) en una cervecería local, y termine con un elegante postre en un restaurante de la playa. Conozca la importancia histórica de las bebidas alcohólicas mexicanas y cómo diferenciar cada una. Entre deliciosas catas, su experto guía le mostrará algunos de los principales lugares de interés de Puerto Vallarta. This was a lot of fun! We found places that we chose to go back to later in our trip and we really enjoyed the other people in our group. Jury sp?, our tour guide, was very knowledgeable and made the tour fun. The food we had was very good, and the drinks were fantastic. There were several unexpected taste treats as well. The walk was pleasant and easy for all in the group. The rest of the week we ran into people from the group so it made it feel as if we had friends in PV!! A great experience!! This tour was an absolute blast! The tour guide went above and beyond. Excellent food, the tastings were fantastic. One of the best tours we have taken in PV. Take this tour and you are guaranteed a good time. This tour is amazing! Amanda is very knowledgeable about Puerto Vallarta food and drinks. The different types of tacos were delicious and the jalapeno margarita was fire but very tasty. We learned so much and had a great time walking the through the streets to all the different places! This was such a fun tour! Amanda was a great guide. She's very knowledgeable on the area and was able to answer any question we threw at her. She took us to several places that had amazing food and drinks! It's not very walking intensive, but you are up and down and do journey a fair ways. I would highly recommend this tour. OMG! DO THIS TOUR, DO IT NOW! THE DRINKS, FOOD AND COMPANY WERE ABSOLUTELY AMAZING. HER CHOICE OF VENDORS AND THE ORDER IN WHICH WE VISITED BARS, RESTAURANTS AND FOOD TRUCKS WAS JUST PERFECT. WE LOVED THAT SHE TOOK THE TIME TO EXPLAIN TO US THE CULTURE BEHIND MANY OF THE SELECTIONS. SHOULD WE FIND OURSELVES IN PVR AGAIN, WE WILL TAKE THIS TOUR AGAIN. IT IS THAT GOOD! GRACIAS AMIGA. Amanda was fabulous! Great food, drinks, and company. Great tour. We learned so much about the city, culture and of course food and drinks. Ricardo was extremely knowledgeable, friendly and enthusiastic. We went back to a couple of the stops later in the trip to try more food because it was so good on the tour! This is a must-do when in Puerto Vallarta! The amount of drinks and tacos on this tour was great. However, the tour lasted 5 hours, which felt very long, and the guide was knowledgeable but not very professional. Hostess was awesome!! This should be a must do for anyone visiting PV. Great mix of places, food and drink. Awesome tour. The information alone is worth the money. Our guide Ricardo was extremely professional and arrived on time. He took us to several local restaurants where we were able to try different dishes and drinks. We learned a lot from this tour and would definitely recommend to anyone who is interested.